Jazmin won National awards such as the NAACP’s ACT-SO competition and was chosen to perform at the NAACP closing ceremony in Orlando, Florida in 2008. She was chosen for 3 consecutive years as 1st chair tenor saxophonist for the All State Jazz Band. Jazmin was offered a full tuition scholarship in 2009 to Berklee School of Music as well as Florida State University School of Music. She attended Florida State University and was lead tenor in the symphonic band and also performed with the jazz band/ensemble in several venues. Jazmin graduated in May 2013 and received a degree in Music Education. 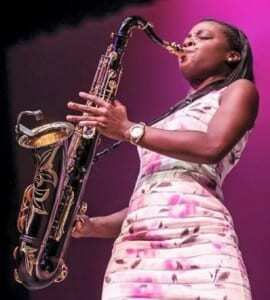 Following a performance on Bobby Jones’ Gospel Show in June 2013, she was offered a scholarship to attend Tennessee State University in Nashville, Tennessee. She is currently a student in the master’s program in music education. Her most recent achievement was being chosen the 1st place winner of the 2014 Smooth Jazz Cruise “Show Your Talent” competition. Jazmin continues to enjoy her true passion, performing and looks forward to what the future brings.